Today, majority of the people do prefer using the soft upholstered furniture because of their comfort and ease. You can find a couple of upholstered furniture items in almost every home and these are mostly found in the most populated part of the house i.e., living rooms. People gather there, watch television, have their meals and conversations. In this case, the upholstered furniture is often used and can get dirty quickly. It is better to look for some do it yourself upholstery cleaning tips and regularly perform it so as it improve the life of your furniture. By seeking a little bit of professional advice and some effort, you can really easily manage the upholstery cleaning and give your furniture a new and fresh look. Following the home based tips it will not be very difficult for you to clean your upholstery. One must try to make the upholstery cleaning a part of the daily cleaning routine. It will not take much of your time if it is performed daily and will also give you good results. But if it is not performed regularly then it will get worse and you will need to put in extra effort and give extra time to get it cleaned. There are some pre cleaning steps that are recommended to perform earlier in order to make your upholstery cleaning task simpler and easier. • It is better to move away your upholstery furniture from its original place and then vacuum that area where it I placed normally. If you have placed your furniture item against the wall then it is also required to wipe off that wall with some cloth, towel or sponge. Also, if your find any kind of scratch or dings on the wall then it is better to fill it up or repair it at the same time. • The cushions must also be removed from the furniture if there are any and then that part must also be dusted or vacuumed. If you find any kind of crack or stain over there then do mend it immediately. You must make use of the appropriate cleaner for cleaning the stains and polish the furniture to improve its look. • Also do check your furniture if all of its parts are in good condition or not. If you find any kind of damage that cannot be repaired by you then do call the professional repairer to get it done. • It is also suggested that you must not make use of water all the time for cleaning purposes. Always check the label of your upholstered furniture first and do check which material is used in it and then go through the cleaning instructions for that particular material. It is really good to follow these instructions so as to handle your furniture properly. Otherwise, it might get damaged. There are many fabrics that even get discoloured and shrink due to water use so never make use of water without reading the tags. • Even if you are going to use water for your upholstery cleaning then never make use of it in excess. Always make use of a spray bottle for this purpose. • Baby wipes is another good solution for wiping off the furniture. • Always expose your upholstered furniture to natural sun light. It will help in keeping your furniture away from musty bad odours. • If you have made use of water in the upholstery cleaning then do not make use of it until it is completely dried. 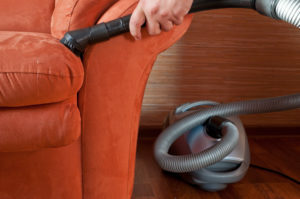 By following these steps you can make the upholstery cleaning an easier task.